Mirage MX 5.1 review | What Hi-Fi? We're really not sure if the picture of these speakers properly conveys the diminutive dimensions of this Mirage MX 5.1 package, so let's run through its particulars. The MX satellites are the smallest speakers Mirage has ever made, standing just 10cm tall and with an 8 x 9cm footprint. The cute little subwoofer weighs 4.6kg, measures just 20cm cubed and packs in a 6.5in driver. If ever a speaker system looked like it had been left in the dryer, it's this one. Mirage's ‘Omnipolar' technology sees a deflector resting above the 16mm tweeter, which is housed in another deflector over the 2.5in woofer. These deflectors mean the MX satellites are using your room's walls, ceilings and other surfaces to create the soundstage. 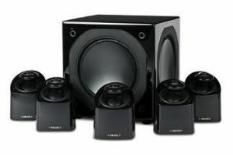 The speakers can be tucked away almost anywhere or mounted with the supplied bracket. It's worth pointing out that the compact dimensions do mean you can't use standard terminated speaker cables, so you'll need bare wire or smaller-sized speaker terminations. Listening to Watchmen on BD, we're certainly impressed at the job these speakers make of filling our good-sized room with sound. Those MX satellites certainly know how to disperse, though as is often the case it's clear that there is some loss of focus and precision to sound effects as a result. Still, integration across the front three, and to a slightly lesser extent the whole five, is impressive. However there's no denying that when the going gets tough, the MX satellites have to strain. Piercing strings and dynamic crescendos see the Mirage lacking scale, detail and composure. The sub does its best, but the overall balance is on the lean side. Placing the speakers closer to the wall would help a touch. There are inevitable sonic caveats, but for the size there's next to nothing else out there like this. If the style and size appeal, and you only have a smaller room to fill, the MX 5.1 could well do the job.